Work is continuing on seaport improvements at Guaymas, Sonora. 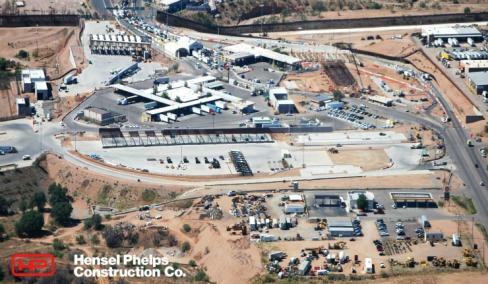 The Mariposa port of entry in Nogales is being enlarged. Due to the expanding trade volume, freight traffic between the U.S., Canada and Mexico is increasing. If the proposed I-11 interstate highway (which would be part of the Canamex trade corridor) is constructed, Tucson would be nicely placed to become a regional distribution center. The Pima County Board of Supervisors may reconsider its opposition to the highway project. Although opposed to the I-11 concept since 2007, county supervisors are now looking at the benefits from expanding Mexican trade as well as reviewing the reasons for their opposition. American history is replete with examples of infrastructure projects that helped develop cities. I-11 could benefit Tucson in the same way. The Erie Canal stretched 363 miles from Buffalo, NY on Lake Erie to Albany on the Hudson River. When the $7 million canal project opened in October 1825, its 36 sets of locks negated an elevation change of 565 feet. An important civil construction project, the canal reduced transportation costs by 95%. 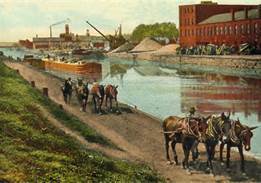 The Erie Canal opened eastern seaboard cities to raw material supplies in the interior. The brainchild of New York Governor Dewitt Clinton, the economic growth fostered by the canal made New York City into a major port and financial center. In 1833, Chicago had a population of about 150. Its location on Lake Michigan at a river’s mouth offered possibilities. As railroads developed in the 1848-56 period, Chicago became the center for 10 railroad lines. Freight and passengers funneled through Chicago at the rate of 100 trains per day. Railroads built yards and shops. The city became a manufacturing location for freight and passenger cars, grain distribution and meatpacking. By 1860, its population had increased to over 109,000. Chicago continues to have more lines of railroad track radiating in more directions than any other U.S. city. Emerging infrastructure technology can also transform a legal career. 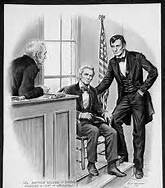 Admitted to the bar in 1837, Abraham Lincoln represented clients in state and federal courts. In his large appellate practice, Lincoln argued over 300 cases before the Illinois Supreme Court. Railroad technology was new; its introduction was creating a host of legal issues regarding construction, compensation to land owners, liability and right-of-way matters. Lincoln gained recognition as a prominent pracitioner of emerging railroad law. An expert in the field, he often acted as an advocate for railroads. As a case lawyer, he represented clients in suits against carriers. In 1853, Lincoln was placed on retainer by the Illinois Central Railroad, a relationship that lasted until he was elected president in 1860. Lincoln had run on a platform that included infrastructure expansion, the building of the transcontinental railroad. Construction began on the Roosevelt Dam in 1905, being completed in 1911. The 1,000 feet wide dam created the largest artificial lake in the world at the time. The electric power and water provided by the dam altered the area’s economy. By 1920, Phoenix eclipsed Tucson and became the largest city in the state. Pima County can take advantage of the prospects offered by the blossoming Canada-U.S.- Mexico trade corridor. If it continues to reject the I-11 project, the increasing volume of freight will require the road to be built in another location. instead of becoming a major distribution hub, Tucson will remain a destination for retirees. Next articleQuestions for Martha McSally: What is your position on women’s access to health care, contraception, and safe and legal abortions?